Anxiety is a common condition in women, particularly when they approach their menopausal years. Most of the time it is a manageable problem that can be dealt with as necessary, using home treatments and coping techniques. Sometimes, however, it can be incessant and severe, which can necessitate consideration of medical therapy. Should this be the case for you, there are a number of options out there which can be helpful. Read on to find out about some different anxiety therapy possibilities. The theory is that these five areas will impact on each other, but only by breaking them down and addressing each one separately will you be able to properly focus and deal with each one. The controlled structure and distinct style of this therapy is helpful for many women when it comes to organizing and digesting their emotions. Being mindful is a term that many of us will be familiar with, but the depths of its meaning are often overlooked. It can be a very beneficial therapy for anxiety because it encourages the thorough examination of what causes our different emotions - including those that lead to feeling anxious. The basic concept of mindfulness is to be fully present and aware of our physical and mental surroundings, without letting them overwhelm us. It is a state of mind that often needs to be practiced, but when achieved it can alleviate anxiety in many women. This treatment is similar to the above; however, many women find it particularly helpful for relieving anxiety and inducing a state of relaxation. While it is recommended that mindfulness be practiced throughout the day, meditation is a temporary activity which can be carried out for just ten minutes, or up to several hours. It really just depends on your personal needs and schedule. Taking time to meditate and reflect can be successful for treating anxiety. After trying other treatments you might be referred to a specialist in order to help you cure your anxiety. Whether this be a social worker, psychiatrist, or psychologist, advice from a trained professional can be hugely helpful. These specialists are better equipped to talk with you and enable you to understand the reasons behind your anxiety, with a view to putting them behind you. Depending on your personal condition, your therapist will possibly also recommend specific actions to carry out at home, in addition to analyzing your problems with them. Women of all ages can experience anxiety, but it is important to know that it doesn't merely have to be accepted and lived with. 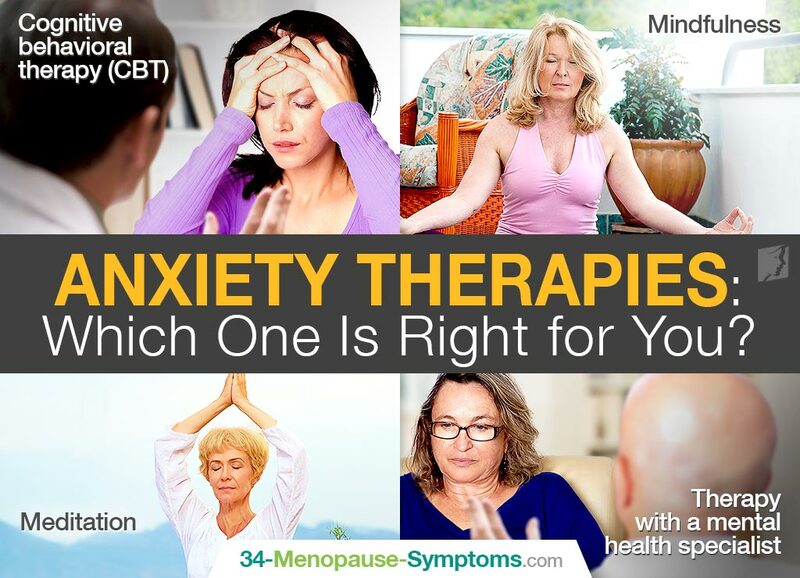 There are a number of therapies and treatments out there, and so it is likely that you will find one that suits you, and that can hopefully cure your anxiety.